The Projeto Onças do Iguaçu has asked for our participation in their Project and specifically for artwork that can be used in an exhibition for the new Brazilian holiday – DIA NACIONAL DAS ONÇAS, November 29. This is such a wonderful opportunity to once again exhibit my work in Brazil to celebrate the Jaguar. This is the painting I have submitted for Dia Nacional das Onças exhibition in Iguaçu on November 29th. I was also asked to explain my technique for the exhibition. 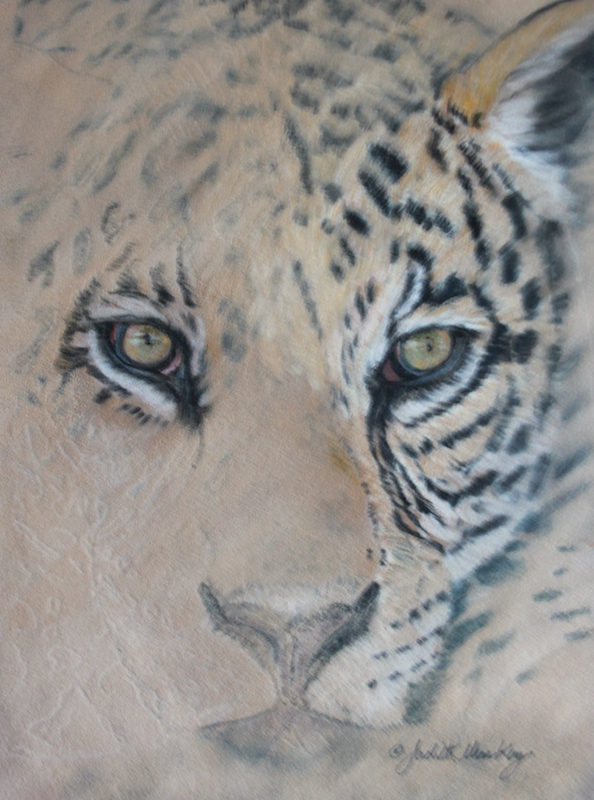 This is what I wrote ” I chose to use velour as this gives a softness to fur, which I particularly wanted for this painting and by rubbing in each layer of soft pastel you build up the image and enhance it with pastel pencils. The eyes are always key with any wildlife painting and this was no exception as they were to be the dominant feature in the finished work. I also wanted to show the right side of the face in as much detail as possible. The left side was just lightly painted using only one layer of pastel. Finally I used the base colour of the painting to rub over and smudge the outline and pattern of the jaguars coat, but keeping the eyes dominant, until I achieved the effect I wanted. It did take several layers to leave just the right amount of the face showing.